Israeli by Day, American by Night: MOUSE MAN! 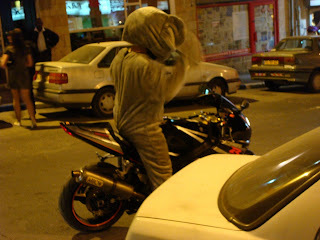 Tonight was the start of Purim, which in Jerusalem lasts through Sunday. Purim is the holiday remembering a very specific story of Jewish past. In short, we were exiled from the Land of Israel (6th century BCE), and found ourselves under Persian rule. Persian King Ahasverus had a high-ranking officer named Haman. When Haman was entering the palace, the high priest of the Jews, Mordechai, would not bow down to him. Haman wanted to kill Mordechai and the Jews, and he got Ahasverus' permission to make a decree to exterminate all the Jews in the Persian Empire. So, Mordechai sends in his niece, Ester, Ahasverus' new queen, and she talks to old Ahas. He loves her, she reveals Haman's plan, Ahasverus has Haman hung on the very trees he planned to hang the Jews on... yay! As we say: They tried to kill us, they got theirs, now let's get drunk! Purim is celebrated by giving gifts to the poor, gifts to our friends (mishloach manot), listening to the reading of the Scroll of Ester (telling this story -- which is found in the Tanach/Bible), and finally, getting very drunk during a ritual meal. If you want to know why, I can tell you. Apparently, in Roman times a custom was developed to dress up in silly costumes for Purim. So, Purim is like the Jewish Halloween, minus paganism and plus a strong religious purpose, theme, and traditions. 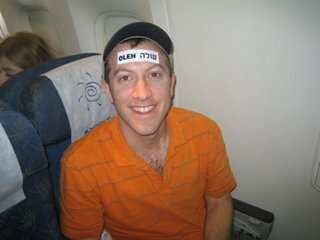 Everyone is dressed up in Israel tonight. Everyone is partying. Everyone is out and about and... most seem to have a mouse outfit on. 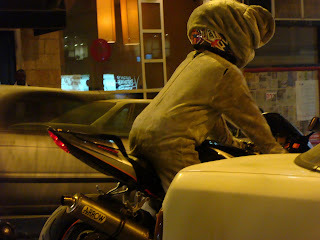 I was walking down a back alley, taking a shortcut to my bank's ATM, when out of nowhere a motorcycle screams by, going way too fast, and the driver was gunning his engine in the manner that cyclists do to get attention. Very manly. Or should I say, very mously? Yeah, I never claimed to be a comedian! But seriously, this was the funniest thing I've seen in months. You don't even realize how much effort it took to get these pictures. I had to chase him around 3 different corners, me on foot, him on a powerful streetbike. Eventually I turned a corner and there he was, getting off his bike, and walking into a sushi restaurant. Five minutes later he comes out, I get the pictures. I felt like either a Mossad agent or a stalker. :) the mouse man. who are these people? I definitely noticed more slutty costumes than last year. Thank you, American influence! Yes! Something about a slutty mouse-girl really gets the motor running, if you know what I mean. Yeah, baby! I know EXACTLY what you mean! Ok, seriously, I like your name, dude. Danny Brothers sounds like a stage name or something.